When an opportunity to work in television came up, Alfredo Rodriguez simply couldn’t say no. Plus, the idea of helping a burgeoning and dynamic business grow was enticing. Rodriguez’s background was that of a traditionally trained marketer for consumer packaged goods companies, but his abilities and passion for messaging and his eye toward the bottom line were a perfect fit for DishLatino. “My instinct was to manage DishLatino as both a business unit and a brand with as much fervor as we were putting behind the Dish brand as a whole,” Rodriguez says. In 2010, he came on board as vice president for DishLatino, which initially launched in 1998 as a first-of-its-kind service. Rodriguez is responsible for overseeing the acquisition, retention and overall profitability of what is, at its core, a suite of programming packages that include both English- and Spanish-language channels. The company ended up being the perfect fit for Rodriguez—Dish Network’s mission and principles line up perfectly with his values, he says, especially the company’s sense of pride and adventure. Along with having Dish’s support, Rodriguez knows he needs a strong team to be successful. He believes in placing people in areas they’re most passionate about, but also stretching them through opportunities that are new and unfamiliar. He notes the diverse group of people working at DishLatino, whose team members include Mexican Americans, Venezuelan and Colombian immigrants, and Americans who are fluent in Spanish. Rodriguez also credits the brand’s agency partners—including Hispanic Group, Marca, and Havas—for their role in DishLatino’s success, particularly through innovative creative campaigns and smart media strategies that have helped the brand further connect with its target audience. What his team discovered is that DishLatino’s market segment is a particular one. It’s either a Spanish-dominant or bilingual household that seeks to connect to their culture and heritage through news, sports, or general entertainment, all while still enjoying English-language content. There are many Spanish-speaking parents who want their children to be fluent in Spanish, something that becomes increasingly harder as they grow up in an English-speaking environment. DishLatino responds to these parents by offering over forty Spanish-language channels, many of them geared toward children and young adults. Rodriguez notes how the sector has undergone dramatic changes over the past five years. It has been a challenge, but also something that pushes him and his team to innovate. One of the more recent initiatives Rodriguez is especially proud of is the work DishLatino has done with Mexican actor, comedian, and director Eugenio Derbez, whose popularity continues to grow among both Spanish- and English-speaking audiences. “Eugenio embodies the spirit of DishLatino because he celebrates both his home culture and his recent move to the US,” Rodriguez says. The brand’s work with Derbez has received a favorable reception from consumers, helping DishLatino maintain its market leadership as the number one provider of Spanish-language pay-TV services in the country. “We’d been entertaining the idea for quite some time, so when the US and Cuba announced they would be restoring diplomatic relations, we felt it was the appropriate time to launch CubaMax TV exclusively on DishLatino,” he says. 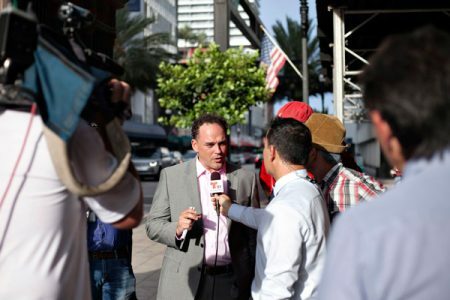 The channel is politics free and focused on entertainment, featuring the best of Cuban programming. “In addition to exposing Dish customers to new content, we felt it was a unique opportunity to help facilitate a meaningful cultural exchange between the countries through art. We have seen viewership for the channel increase every week since launch. It is doing very well,” Rodriguez adds. Moving forward, DishLatino is looking into unique programming opportunities and new loyalty and retention platforms. It also recently partnered with the National Hispanic Institute, a nonprofit that focuses on youth leadership. “We’ve continued to innovate. Innovation comes, we believe, in many forms, whether it’s promotions, programming, or advertising,” Rodriguez says. Clear and consistent brand positioning, innovative acquisition and retention strategies, and brilliant execution has helped grow DishLatino and maintain market leadership. “In the end, knowing our customer and delivering on his or her needs is at the center of everything we do,” he says.